Guido and his pals Moreno and Katango are rebels without a cause living in a rural town of the Po Valley, a forsaken corner of the Italian countryside turned peripheral wasteland. Disaffected students of the local vocational high school, they spend their days trying to get high as a way to forget about the bleak hopelessness around them. As children, they enjoyed being the sons of rural folks and the country seemed to them a never-ending reservoir of wonders. Now that they are almost finished with high school, they much prefer to drive to the nearby Rimini and its Riviera, check out its flashy dance clubs and end up wasted on its shores. Male friendship and camaraderie are paramount: the eroticism, the violence, the power struggles—it's all there on the page. Near Guido live the Stancic, a family of Romani who escaped the communist regime of Marshal Tito and settled there just after World War II. Running parallel to the protagonist's coming-of-age is the evolving relationship that the rural town has with this group of outsiders. The author is unsparing in his depiction of the townspeople's cruelty: there is a whole catalogue of ways in which Romani people are scapegoated and made victims of the most absurd prejudice. And yet, there are also many instances of solidarity between Guido's community and the Stancic. Spit Three Times is unlike any conventional graphic novel. Its language is more poetic than narrative. The dialogue is deeply suggestive and fraught with resonances and multiple meanings. Add to this the beautiful artwork and its every page is lyrical and moving. 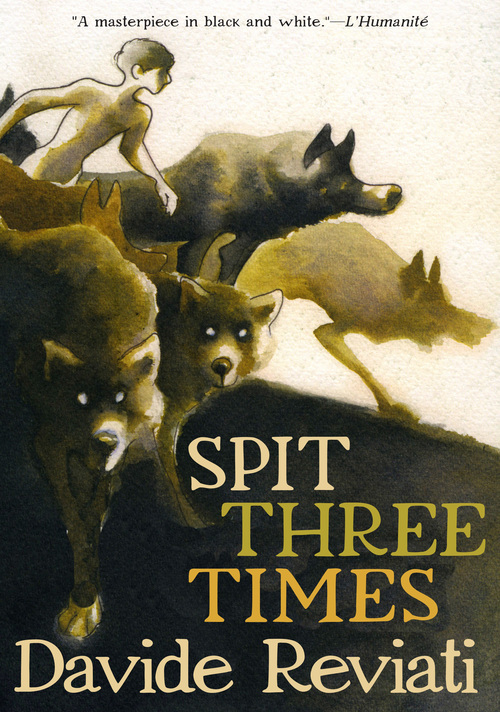 Reviati's first book in English, Spit Three Times is an extraordinary story of young men, disillusioned and trying to find their way, caught in the breach between post-war exuberance and the stagnation of the early 21st century. Available for pre-order. This item will be available on October 15, 2019. Davide Reviati is an Italian cartoonist and illustrator in the Italian media (il Manifesto, La Stampa, L'Unità), and a screenwriter. His graphic novel, Morti di sonno (Coconino Press, 2009), won the 2010 Napoli Comic Con, and the best book in translation for its French edition (Casterman 2011). Sputa tre volte (Spit Three Times) was published in Italy in 2016 after seven years of crafting story and illustrations.